Christian discipleship is the lifelong process of following the teachings of Jesus. The ultimate goal for all of us as disciples of Jesus is the full realisation of both the character and destiny that Jesus has in mind for us. We know that great discipleship has a powerful capacity to bring about remarkable transformation in ordinary people. Our heart at BCC is to create as many opportunities, in as many ways as possible to learn from Jesus, and how to copy his life into our daily lives. These opportunities could be through conversation, friendships, teaching series, Lifegroup material, Bible studies, conferences, internship programmes, leadership mentoring, missions work, children’s activities, outreach opportunities and reading resources – to list just a few. 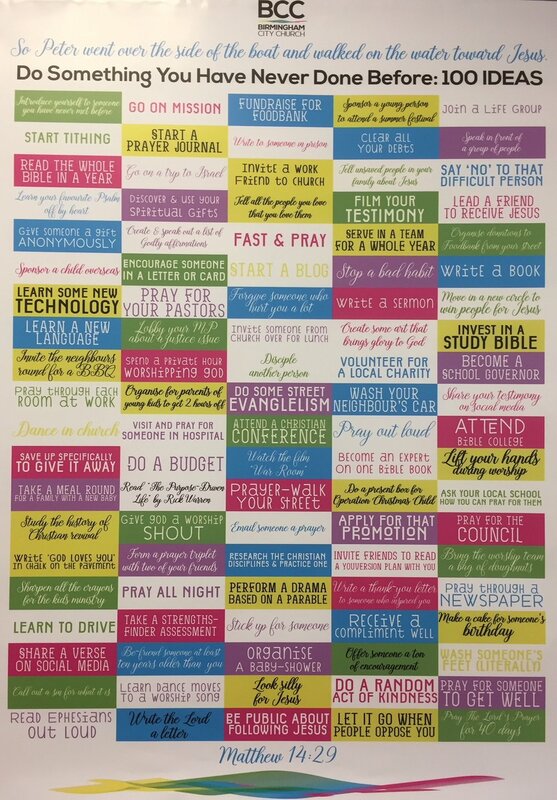 See our poster inspiring you in one hundred ways to step out of the boat (Matthew 14:29) in your personal discipleship journey!